Cane & Rinse 18 was edited by Jay Taylor. 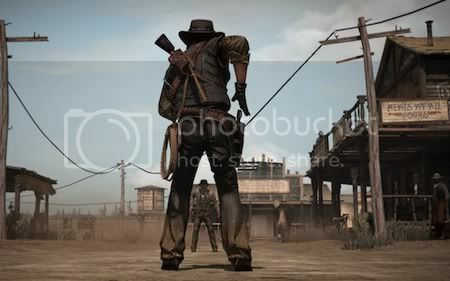 Here's a Quick Rinse of Red Dead Redemption courtesy of Joshua Garrity. Listened to this podcast the other night. When I originally played this game there was something about it that just didn't click. I loved the setting, the atmosphere, the audio and graphics, even the story. Basically everything apart from the missions! They became a real grind I found and the game became a real chore to play. Having listened to the podcast I was inspired to replay the game. I traded my PS3 copy soon as I'd finished it so I was planning on grabbing a pre-owned copy this weekend, and then as luck would have it the game was this weeks freebie on PS+. So I started playing it over the weekend and am loving it. I'm not sure how much I can attribute to the podcast, but I certainly wouldn't be replaying it if I'd not listened! That's cool. We love to inspire! Good timing with the PSN+ freebie anyway (although it has to be said that the 360 version looks noticeably prettier - though I'm guessing from your sig you are single format). I do have a 360 as well but I tend to use my PS3 way more. I think it's because I don't have a gold sub on Live, coupled with the fact the Playstation seems to run a lot quieter than my first gen 360. I think Mass Effect 3 is the only game I've played on 360 this year and that was only because I'd carried my save since the first game. I may well go back to 360 for GTA V though, and I sorely wish I'd purchased Skyrim on the Xbox rather than PS3! Good call on the ambient machine noise. I've had a 360 slim so long now I'd forgotten the jet engine noise (and heat) levels of the 'classic' 360. The noise on this generation of consoles is very valid. There's 3x 360's in the house, two Elites and one S, one of those elites has a dodgy fan in its PSU and it's incredibly irritating, the other is quieter but after using an S it's definitely noticeable. Of the two PS3's I have an original 60gb and a Slim 120gb and, honestly, I can't even use the 60gb anymore due to noise and heat, it's the most ridiculously loud thing ever, the 120gb is beautiful and, whilst it's slightly louder than my 360s it's definitely a lot cooler so I am not as uncomfortable on a night playing that as I am any other machine. The impact the consoles can have on enjoyment is absolutely huge and, if possible, try and get an Xbox360 S to replace the original one, the difference is very sizeable. It's a great way for the game to end, and I agree with the way they did it, but I also know a lot of people like yourself who completely missed it as a result. It still surprises me that they hid away that extra scene the way they did, It has major ramifications on the plot yet I would wager the vast majority of RDR players have no idea it even exists. Yep Dom that's the bit.